The heart blocks can be used to make a baby quilt, lap quilt, wall hanging, table runner or you could even use them to create greeting cards. 1. Colors to use for this project are black and white. 2. Cut a 7” block of either black or white. It can be solid or a print. Mix it up. 3. 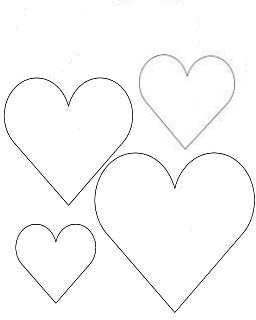 Cut out 1 or more contrasting hearts using the templates provided. I used a fusible web on the back of my fabric…. Fabric glue will work as well. 4. Arrange the heart/hearts so that it looks pleasing to you, then machine or hand applique them to your 7” block. Be creative…You can embellish your block with words, lace, buttons, pearl cotton threads, or a cutter quilt. 6. Please make at least 2, but I’ll bet you’ll make more…….they are fun to create !